Whether you're hunting waterfowl or simply shooting near water, you'll want to use a steel shot load like this one. 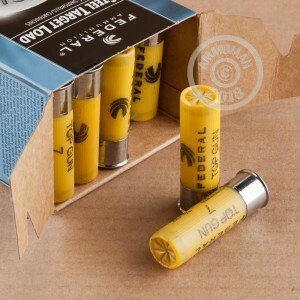 These Federal Top Gun shells for 20 gauge shotguns fire a 7/8 ounce load of #7 shot at 1,210 feet per second, making them ideal for most sporting purposes. 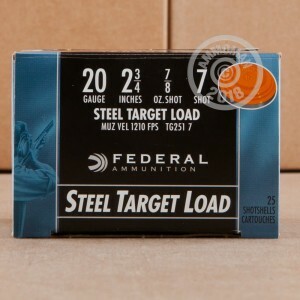 Each box contains 25 shells in the popular 2-3/4" format. They are a relatively light kicking load suitable for shooters of all sizes and skill levels. 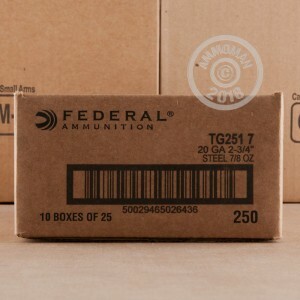 Buy up as much ammo as you need at AmmoMan.com and don't worry about nasty surprises at checkout: all orders over $99 ship for free!